Two of the biggest Japanese online games, it appears, are collaborating. And you thought these games were rivals? Ha! This was suddenly announced today at a Phantasy Star Online 2 event in Tokyo. 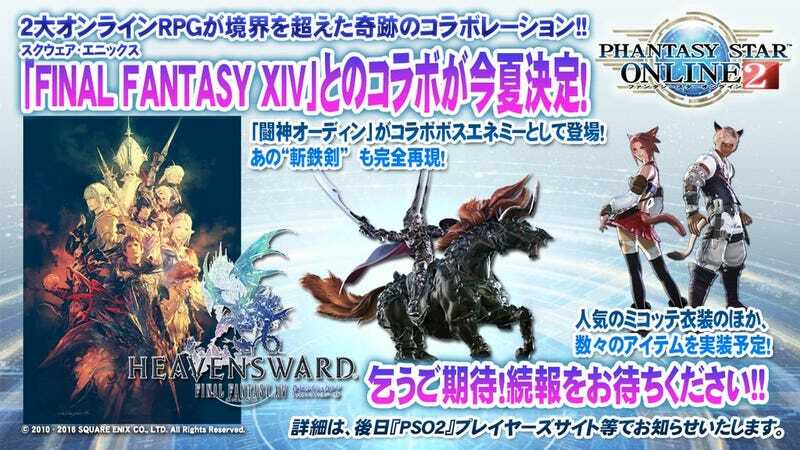 According to Famitsu and 4Gamer, the Final Fantasy XIV incarnation of Odin will appear this summer in PSO2 as an enemy boss character. That’s not all, other FFXIV items, such as Miqo’te outfits, will also appear in PS02. More details are expected at a later date. And please, don’t be surprised if Phantasy Star Online 2 items and characters show up in FFXIV.